APHARD TIMES: Even in relatively well-off families, money is always in short supply and the comfort of the elderly often takes the back seat. Rs. 200 / month? I spent Rs. 200 this morning. What did I get? Apart from the atta, which will last 4 days, the other items will be finished by tomorrow, by our family of 4. Not to mention provisions already in stock. Why 2 kg tomatoes? Everyone at home is sniffly & sneezy. Cold and cough are going around. Tomato soup, made with onion, garlic, ajwain and tulsi aid our recovery. So will the santras. The same cold and cough can turn much worse for the weak and hungry, especially without clean water, proper shelter or blankets. Or Rs. 200 for fruits and vegetables. Food prices are through the roof. Six months ago I paid Rs. 150 for the above. Rice and wheat are subsidized – so far. What about pulses? The WTO has put the brakes on supplying oil and pulses in the PDS. The elderly are rising – and not a moment too soon. We need their voice in the struggle for food security for all. Don’t sell out local food traditions with packaged food in the name of rehabilitation and development. In the immediate rescue-and-relief scenario, packaged foods may play a role in ensuring that people do not go hungry in the aftermath of a disaster. However every packaged food company wants its product to be considered ‘normal’ and everyday food, not just for emergency. The food industry has managed to convert huge populations in Western and urban Indian areas to their ways, accepting packaged food as an ordinary everyday item. When these industries and the people they have converted are in charge of disaster aid, then there is a likelihood that the packaged foods and nutri-powders that are heavily marketed on front pages and prime time television will be considered not only as emergency relief material but a part of ongoing rehabilitation assistance packages. As Naomi Klein reports in Disaster Capitalism: How to Make Money out of Misery, “‘Where has all the money gone?’ ask desperate people from Baghdad to New Orleans, from Kabul to tsunami-struck Sri Lanka.” The answer, she explains, is to those who already had money. Klein and other journalists have reported on this after Hurricane Katrina, Sandy, and other disasters in the United States. I have seen this happen after the earthquake in Gujarat and the tsunami in Tamil Nadu. Lakhs of rupees are budgeted for something like a feeding center, but if spent on packaged food, those lakhs end up in the hands of Britannia, GlaxoSmithKline, Parle, and Nestle. What ends up in the people’s hands are biscuits and powders. What ends up in their lands is the packaging. The brands get recognition. The biscuits and powders boast nutrients on their labels but in reality offer little value compared to foods prepared locally from fresh ingredients. Though this may seem obvious, the relentless push of the food industry to make packaged food normal and indeed preferable to homemade food tends to extend its use beyond the period of relief, into the phase of rehabilitation and eventually into the normal diet. When we recognize the local food that people have traditionally grown and eaten in an area, we can look for ways to rebuild the supply through diverse channels, sustainable agricultural practices, and thus build local food sovereignty rather than bringing food and food-like substances from remote locations through centralized routes. We must also guard against the role agribusiness plays in pushing government policy in their favour, as Biju Negi of Beej Bachao Andolan has written today in “Deceptive Intervention for Millets.” He warns that government intervention will destroy traditional millet farming in the Himalayan region. In the same state or district where a disaster has struck, there may be farmers who can supply food required for rehabilitation. If not immediately, then some time after, especially if building their capacity is part of the rehabilitation plan. It is important to link with and procure from these suppliers, sustaining local livelihoods as well as food traditions. This requires us, after the initial relief phase, to look beyond “feeding the disaster-affected” to approaching community rehabilitation in a holistic way, drawing on the strengths and resources of disaster-affected and non-disaster affected people. When I met the Koya tribal people who had been displaced from Chhattisgarh by Salwa Judum, I saw that they carried with them their seeds of sama, korra and other varieties of millets and were growing them in whatever small space they could make in the forest, processing them at home and eating them. From the government as well as the local NGO, however their relief package consisted of white rice, nutritionally inferior to millet. Even though in the very same Khammam district, there were farmers growing the very same grains that these people were used to eating. Why hadn’t the NGO bought those grains to use in the feeding centre? Throughout India farmers and social organizations are fighting an uphill battle to sustain local grains. Yet they are neither included in the public distribution system (PDS) of the government nor through the private suppliers who have the infrastructure to work with large donor agencies. In this case, the donor agency had stipulated that the food should be procured through specified routes that conformed to their supply and billing systems. This meant that rice coming from some other part of the state or even other states could be used in the program, but not the millets growing in the same district. After eating white rice, would the next generation remember how to recover their diverse food traditions? Even if the NGO had found a way to include diverse and local grains in the relief package, they would have been more expensive since they aren’t part of the public distribution system and don’t receive the subsidies that white rice does. The question is, can the donor agency recognize the value of the local food traditions, biodiversity, local economy and community health that are part of that grain, above and beyond its weight in kilograms? This calls for strengthening local distribution routes as well as local capacity, and commitment to existing Acts such as the Forest Rights Act and to the policy of land to the tiller, which would guard against further insecurity and in fact would have helped people resist this displacement in the first place. Disaster capitalism goes beyond industrial food, Big Ag, Big Aid and Big Box, to the heart of economic policy. As United States secretary of state, Hilary Clinton declared openly that the pillars of American foreign policy were development, defense and diplomacy and these would be used to ensure America’s (meaning corporate America’s) access to global markets. Read, for example, Hilary Clinton, America’s Pacific Century. Commenting on Naomi Klein’s book The Shock Doctrine: The Rise of Disaster Capitalism, economics professor and former World Bank economist Joseph Stiglitz writes about “the political machinations required to force unsavory economic policies on resisting countries (Stiglitz, “Bleakonomics,” New York Times, September 30, 2007). These policies include privatisation of natural resources including water and land (or as Luke Erikson puts it, “Land from the Tiller”), public utilities such as electricity, and even public services such as health, education, and transport. Though touted as the solution to poverty, these policies further deprive the poor, by defining development and progress in a way that discounts their own strengths and resources. Consider the case of water. The Ministry of Water Resources’ draft water policy (2012), encourages the private sector and cuts agricultural and domestic subsidies, in line with World Bank recommendations. It states as a basic principle: “evolving an agricultural system which economizes on water use and maximizes value from water.” Unfortunately the history of water policy in India shows that maximizing value is not counted according to the numbers of people who have secured food and water, but rather the monetary value of that water and the goods it is used to produce. This serves the needs of the food (and beverage) industry. The hundreds of dams that are part of the drive to privatize have also aggravated the present floods in Uttarakhand which in the past week have claimed thousands of lives and rendered more than one lakh people homeless. India Climate Justice has called for a halt to construction of dams in the Himalayas pending review, and has noted that the Comptroller and Auditor General warned that this series of dams and hydropower projects could be environmentally damaging. Himanshu Upadhyay has detailed the failure to heed these and other crucial CAG warnings in Uttarakhand: Ignoring the writing on the wall. Apart from potential to aggravate floods, the series of dams diverts water to power houses and away from traditional irrigation systems, serving small local farms. In situations of chronic hunger, the food industry need not wait for any specific disaster to strike before bidding to introduce their products. Since the hunger is chronic, the contracts will be long-term. Consider this ominous title of a UNDP Report: The Roles and Opportunities for the Private Sector in Africa’s Agro-Food Industry. The author of the report is “UNDP Africa Facility for Inclusive Markets.” Its stated focus – namely, ”development and expansion of regional value chains in job creating sectors such as agribusiness…” – works against the goal of local food sovereignty towards privatization and globalization. Industrially packaged food that enters as an emergency measure must not come to be regarded as the new normal. Those involved in supporting rehabilitation programs should take care to guard against the push of this industry to reach new consumers, particularly in vulnerable times, and thus move more people away from the local, diverse, whole and home- made food that is the foundation of health, livelihood,community and food security. Note: India Together has published this as “Beware of disaster profiteering” on 2 July 2013 . Loss of forests, depriving forest-dwelling communities of livelihood as well as food / medicine that comes from the forest, as well as overall health of ecosystem. Land acquisition for industries and projects that benefit industries, rendering 1 million people per year landless, homeless and food-insecure. I would like to discuss two cases, from Srikakulam and Khammam Districts respectively, of people’s experience with traditional foods, the obstacles people face in “remembering” them, and the impact this has on people’s breastfeeding, health and the social fabric of life. 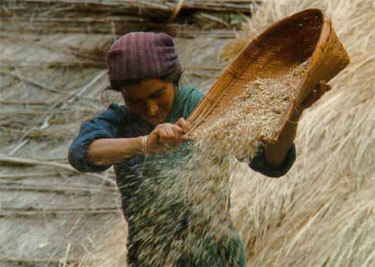 Nutritional supplementation with local millets. In rural Srikakulam District, a program of nutritional supplementation with local millets has been in place for 5 years. Run by an NGO, AID-India, the program targets malnourished children below the age of 5, and has successfully brought the children to normal weight as per ICDS weight charts. However obstacles remain in restoring millets as a normal part of the local diet – it is fast becoming or has already become a “forgotten food.” It is not procured by PDS, not served in ICDS, and not supported in agricultural policy in spite of its demonstrated value for individual health, farmer’s livelihood, and land. At the same time, we observe that communities still practicing traditional diet with not just one but several varieties of local millets as part of their diet, are facing threat of extinction. One example is the Koya adivasis, forced to flee their homes and lands, and now living as Internally Displaced Persons without land. Greetings from Organising Committee of World Breastfeeding Conference 2012! We are pleased to inform you that the abstract for the presentation submitted by you for World Breastfeeding Conference to be held on 6th-9th December, 2012 in New Delhi has been accepted for oral presentation in conference programme on 08/12/2012 at 16.30-18.00 hrs. Your presentation has been scheduled for the session TS-14 (Research papers on various aspects of infant feeding) as indicated below in session summary. Impact of the promotion of breastfeeding support for women in four hospitals in the Pacific island country of Solomon Islands. Each speaker will be allotted 8-10 minutes for completing the presentation. We’re looking forward to your participation at the conference. If you have any queries, please do not hesitate to contact us. Please Note: If you are not the author presenting your paper, please forward this message to your co-author who is doing the presentation.